The Epcot International Food & Wine Festival is our family’s favorite time of year. We spent an obscene amount of time and money during the festival and with so many things to try, it can be a bit overwhelming to choose the best things from the options at all the stations. As a self-appointed Festival Expert (f shelling out obscene amounts of time and money constitutes me as an expert), I’m sharing my favorite dishes from the festival this year. A few things we noticed about the festival this year. There were fewer international stands. 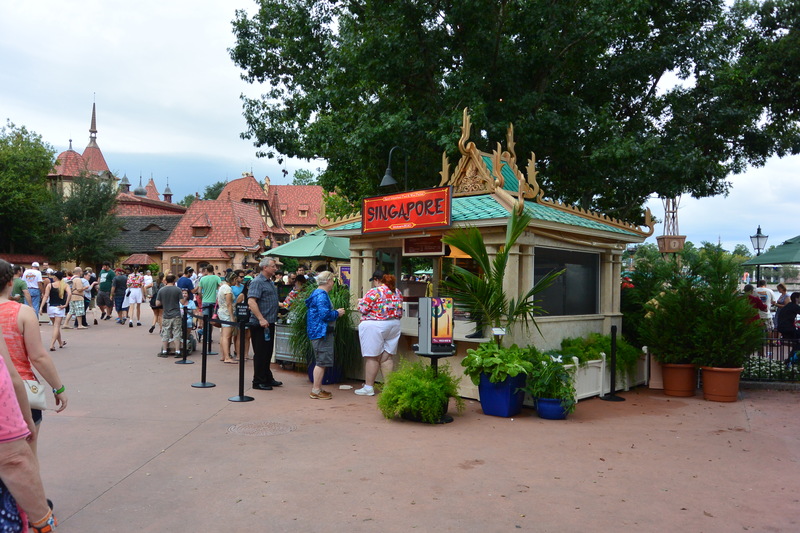 Instead, Epcot beefed-up their passports by listing offerings available at static carts, including the many coffee carts available around the park. The other thing we noticed was that drink size was significantly reduced, with all beers/wine/cocktails available at international stands being a standard 3 oz pour. Beer flights are still available in some locations. So here are my favorites, something from each international station to try. Unless there was something spectacular at a static station or coffee cart, I’ll just pass over them. We’re going to start from Scotland and go counter-clockwise around the world showcase. Scotland: Have the Fresh Potato Pancake with Smoked Salmon and Herb Sour Cream. You won’t be disappointed. Hawaii: The Kalua Pork Slider with sweet and sour Dole Pineapple Chutney and Spicy Mayonnaise is one of Justin’s favorites. When ever we pass the stand he gets a little misty eyed. Desserts & Champagne: They did away with our favorite champagne this year, The Moet & Chandon Ice Imperial but they replaced it with Dom Perignon. Enough said. Puerto Rico: The Puerto Rico stand returned this year with an all-new area. Get the San Juan Breeze with Don Q Limon. 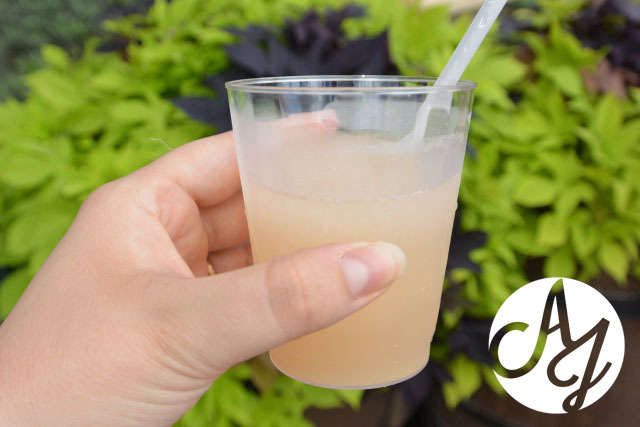 It tastes like a fresh squeezed lemonade, with a bit of a punch at the end. The area is also really incredible. Maisy was very worried about the little baby pineapples. We did not see any Momma pineapples around looking after them. Refreshment Port: TREAT YO SELF to the amazingly sweet, flakey and delicious croissant doughnut with cinnamon sugar. This offering is available at EPCOT year-round, but that doesn’t make it any less special. What does it taste like? The cinnamon-sugary kisses of a pastry angel. 100% accurate. Greece: While you’re licking your fingers clean of your Cronut, pop over to Greece and get adventurous with the Tzatziki Martini. If you’re familiar with traditional Tzatziki sauce used in Greek cooking (cucumber, dill, and Greek yogurt), you probably cringed a bit–I know I did. This martini is made with Crop Organic Cucumber Vodka and BOLS Natural Yogurt Liqueur. It’s not so much Greek yogurt-y as it is creamy and sweet. I was really surprised! Canada: The one item on Canada’s menu that never ever fails to be delicious year after year is the “Le Cellier” Wild Mushroom Beef Filet Mignon with Truffle Butter Sauce. Yum! Ireland: Guess what’s back again this year? The Kerrygold Cheese Selection! This little plate of deliciousness is a favorite of ours, and Maisy gobbled it up too! France: One of my favorite items to get at Food & Wine has always been the Escargot. Previously, the dish came as three little bread rolls with the escargots drenched in all kinds of yumminess inside the little bite-sized roll. Now, thanks to the celebrity chef of the festival, Robert Irvine, the recipe has gotten a make over. The Tartlette aux Escargots is an escargot tart with garlic, spinach, bacon and parmesan. It’s designed to be rich with antioxidents to protect your eyes (Transition Lenses is a major sponser of the festival this year, so this theme is seen everywhere). The dish tastes delicious, but I still miss my little rolls. If it ain’t broke, why feel the need to fix it? Thanks, Robert Irvine. 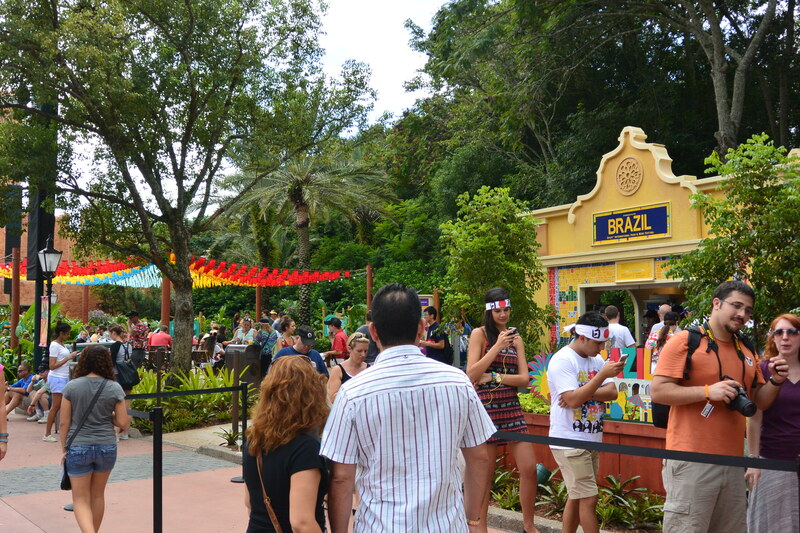 Brazil: This pavilion also got a makeover this year. You should try the Crispy Pork Belly, served with black beans, and tomato and cilantro. If you’re thirsty, pick up the Frozen Caipirinha featuring LeBlon Cachaca. It’s sort of like a frozen rum lemonade. Belgium: Chilled Coffee featuring Godiva Chocolate Liqueur. I think I’ve said enough. Morocco: If you’re not getting the Mimosa Royale – sparkling wine with orange juice and orange liqueor — you’re doing it wrong! Japan: Justin went crazy for the Teriyaki Gyoza Bun — a steamed bun filled with chicken, veggies and sweet teriyaki. Sort of like a Japanese empanada. Delicious! Side note, if your head is spinning a bit by now, this is a great place to let your little one out of the stroller to look for ducks. Block & Hans: While we are still mourning the loss of the Moet & Chandon Ice Imperial, Block & Hans offers glasses of Domain Chandon Brut Sparkling Blanc de Noir, a light, not too dry champagne that quickly became a new favorite. Plus, the bottle is BEAUTIFUL. Hops & Barley: Gotta have my Florida Grass-Fed Beef Slider with Pimento Cheese. Fife & Drum: Mmmhops Pale Ale. This beer has been brewed by none other than the Hanson brothers. Sip on this sweet sensation while listening to Mmmbop. It’s an experience. The experience may move you to purchase ridiculous sunglasses for your daughter. Be warned. Poland: Frozen Szavlotka – Apple Pie featuring Zubrowka Bison Grass Vodka. Try it. You have to! Germany: One of my favorite stops around the world. You need to have the Roast Bratwurst on a Pretzel Roll. It’s a classic dish that can’t be beat. Singapore: Signapore is now located where the mystical country of Cheese has been for the past two years (RIP). Maybe this food isn’t up my alley, but the Singapore Sling featuring Hendrick’s Gin and Cherry Herring is bangin’. Africa: Another antioxidant-rich dish brought to you by Robert Irvine and Transition Lenses here. Try the Beef Tenderloin Tips, Berbere-style with Okra, Jalapeños, Tomato and Pap. South Korea: Another cuisine that doesn’t exactly tickle my fancy. I was pleasantly surprised by the Kimchi Dog (not made of real dog) with spicy mustard. It was a little spicy hot dog of kimchi–a spicy/sweet veggie slaw. China: We LOVE the “Sticky Chickys” or Chicken Potstickers if you’re not my 2 year old. Farm Fresh: A new stand this year, Farm Fresh seemed to replace the Florida Local stand from last year. We enjoyed the Nueske’s Pepper Bacon Hash with sweet corn, potatoes, Hollandaise and pickled jalapeños. Spicy, peppery, cheese, bacony. Not bad at all. Mexico: Get behind that Shrimp Taco – Fried shrimp, pickled habanero pepper and onions on a flour tortilla. The mango-strawberry margarita was also amazing! Australia: One of my festival favorites is the Grilled Lamb Chop with Mint Pesto and Potato Crunchies (fancy way of describing potato chips…) It’ll make you feel like a monster when you eat it, but OH BOY it’s worth it! Craft Beers: They moved the Craft Beer cart over to the Odyssey pavilion. It’s now a quiet, open space with plenty of great brews to try. We love the Dogfish Head Punkin Ale, Good Islands 312 Urban Wheat Ale and Abita Brewing Company’s Purple Haze. If you’re looking for food, try the Muffuletta Pinwheels with house-made pickles. Delicious! New Zealand: The steamed Green Lip Mussels with Garlic Butter and Toasted Bread Crumbs are our favorite! Patagonia: Another new stand this year. The Grilled Beef Skewer with Chimmichurri sauce was redonkulous. Terra: Have whatever vegan delight pleases your palette and then tell me all about it. Just couldn’t get myself to try anything here. I’d love to hear what you recommend! Have a favorite at the festival I have to try? Share it with me in the comments!